“When am I ever going to use this?” This is the query of many students who are required to take mathematics courses. However, scientists aboard the NOAA Ship Oscar Dyson use mathematics every day as part of their job. As discussed in a previous blog post, underwater acoustic data are collected as the NOAA Ship Oscar Dyson navigates along the transects. These backscatter data are relied upon to decide when to take trawling net samples as well as to estimate the number and biomass of pollock in the area. How do these underwater acoustics work? The answer can be found in mathematics and physics. As previously discussed, echosounders affixed to a centerboard below the hull of the ship send an audible ping down into the water and measure how long it takes to bounce off of an object (like a pollock) and return to the surface. The echosounders know the transmitted signal power (denoted Pt) and measure the received signal power (denoted Pr). Measuring the time between the signal transmission and reception and multiplying by the speed of sound (approximately 1450 m/s, given local water salinity and temperature conditions) will allow the calculation of distance of an object below the surface (or range denoted r). Using acoustics properties combined with known properties of pollock, we can get the equation for backscattering strength at a point as , where β is a constant and C(r) is a constant that is dependent on range. The value on the left-hand side of this equation is commonly referred to as target strength (TS) and is an important value to complete the survey. The target strength is the amount of energy returned from a fish of a certain length. Since the echosounders are transmitting through the water column below the ship, the TS values are converted to backscatter strength per volume unit of water, referred to in the literature as Sv. The Sv values are graphed on the EK60 scientific echosounder, giving a picture similar to the one below. Different colors in the output are matched to various ranges of Sv values. 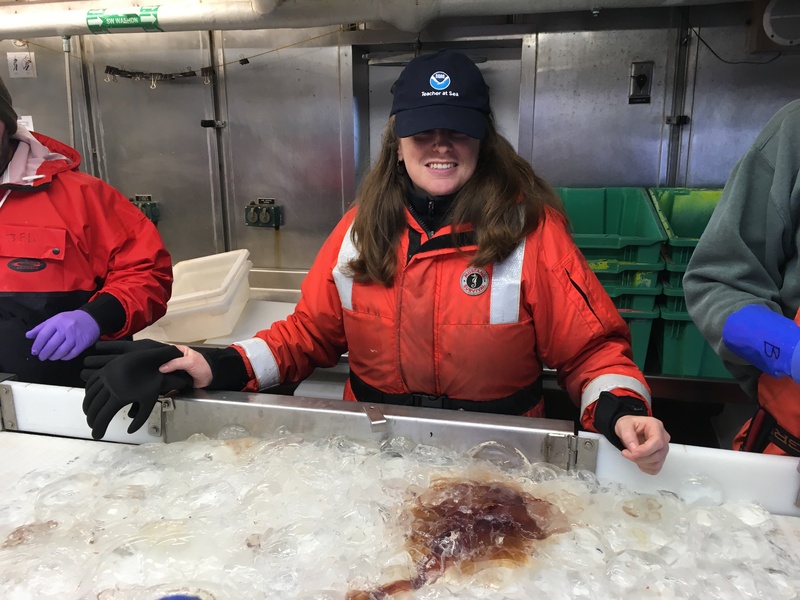 An experienced fisheries scientist, like the ones aboard the NOAA Ship Oscar Dyson, can use the echosign data to determine a possible picture of the ocean life below the ship. While the EK60 scientific echosounder can transmit at five different frequencies (18 kHz, 38 kHz, 70 kHz, 120 kHz, and 200 kHz), the 38-kilohertz transmission frequency is the best frequency to detect pollock. 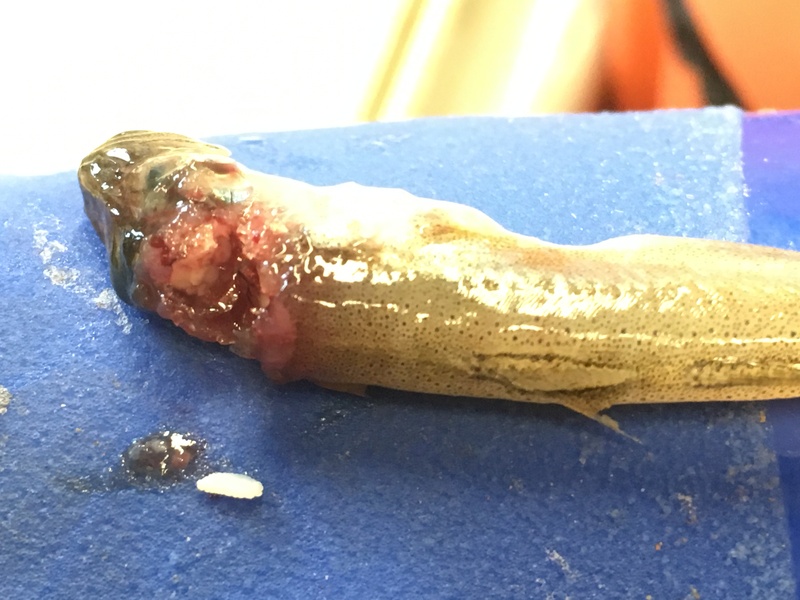 Other transmission frequencies are shown to help delineate adult pollock from baby pollock and from other types of fish and smaller crustaceans called euphausiids. Screenshot of an EK60 reading of the water column below the ship with identifying features notated. The target strength is related to the length of the fish. The age of pollock is strongly correlated to their length until they are about 4 years old, so length can help the scientists determine how many of each year class are in the ocean below. Once again, logarithms come in handy, as the equation that relates the fork length in centimeters, l, of the pollock to the recorded target strength is TS = 20 log l – 66. This allows the scientists to use the echosounder data to get an approximate measure of the fish below without having to catch them. 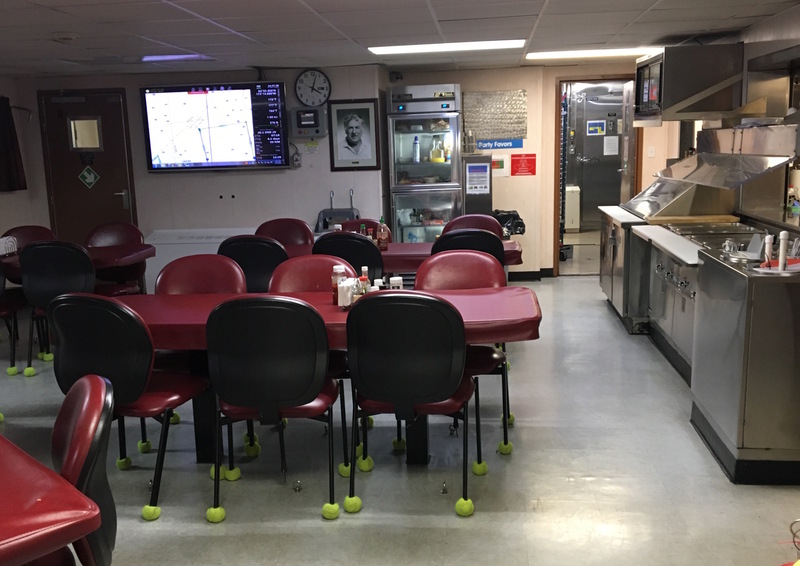 Today we will be going on a partial tour of NOAA Ship Oscar Dyson so you can see where I spend most of my time while aboard. The first stop is my stateroom, where I sleep and relax when not on shift. The top bunk is mine and the bottom bunk belongs to my roommate, NOAA scientist Abigail McCarthy. Our stateroom has one window where we can check on the weather and sea conditions. The picture below shows our view most of the time: cloudy! Next stop is the mess hall where three meals a day are served. The stewards do a great job of cooking creative meals for everyone aboard. Before I boarded the ship, I bought a lot of snacks because I was worried about not getting enough to eat, but boy was I wrong. There is always plenty to eat at every meal, snacks that are out if you get hungry in between, and lots of dessert! Finally, we come to the fish lab where the trawling net samples referred to in my last blog post are processed. Before processing, we go to the ready room and put on our gear. This includes work boots as well as waterproof coveralls and jacket. Measuring the length of the pollock can get messy so we have to have the right gear. Once in the fish lab, we grab our gloves and get to measuring! The fish lab where samples from the trawling net and methot are processed. Scientists aboard the NOAA Ship Oscar Dyson are part of the National Marine Fisheries Service (NMFS), which is one of the six major line offices of NOAA. 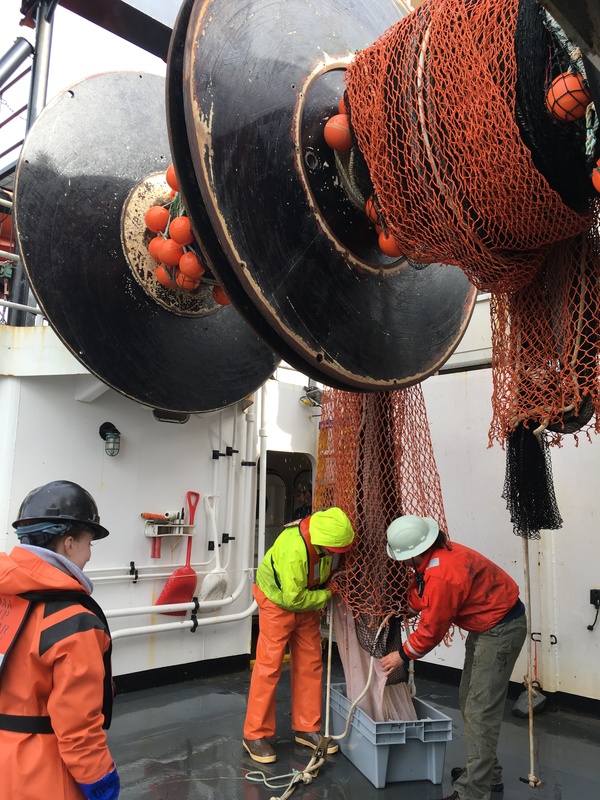 Scientists aboard NOAA Ship Oscar Dyson are aiming to estimate the number and biomass of pollock in the Eastern Bering Sea, which, as you can imagine, is a big undertaking. In order to complete this job, they use a lot of sophisticated technology to determine where the fish are as well as statistical methods to extrapolate the total number of fish from the samples taken. 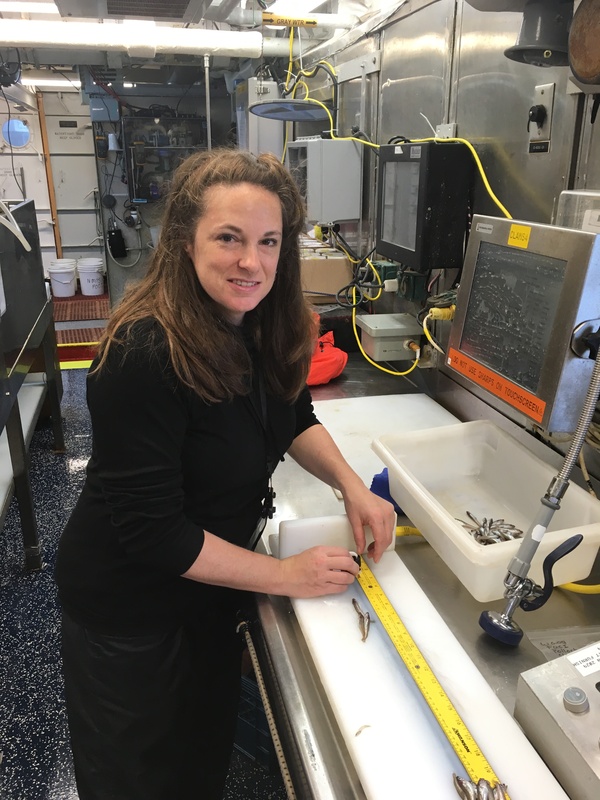 This job is extremely important as it helps to determine the health and sustainability of the pollock population in the Bering Sea so that the government can model and forecast next year’s population numbers, and the North Pacific Fishery Management Council can set future catch quotas. The first piece of technology used is the underwater acoustics. Echosounders send an audible ping down into the water and measure how long it takes to bounce off of an object (like a pollock) and return to the surface. Using the known value of the speed of sound, this technology can create a picture of where the fish are below the boat. While the acoustics only show that there is an object the length of a fish below, the scientists use their knowledge of the regions pollock normally occupy, the depth they regularly swim at, as well as the shape and size of pollock aggregations to determine when they are seeing pollock versus other types of fish. The picture of the fish below the water created by the underwater acoustics. Once it is determined that there is likely a large school of pollock in the area, then the trawling nets are deployed to catch pollock. Once the nets are hauled in, the total catch is weighed and then a smaller sample is pulled to collect length and weight data to determine the sizes of fish in the area. Other samples, such as the pollock ear bone (otolith) or ovaries may also be taken at this time. Using statistics, the number and length of pollock in the entire catch and then in the entire area is estimated. Trawling nets on the ship. The flight into Dutch Harbor was very exciting. Before boarding the plane, they weigh you and your carry-on baggage to make sure the plane will be balanced and that there is not too much weight. The airport at Dutch Harbor is not much more than a landing strip between two mountains. We came in for landing right over the water and for a second it looked like we might land on the water before the landing strip appeared. Once we reached the dock where we boarded the NOAA Ship Oscar Dyson, I saw a sea otter, but it disappeared before I could take a picture of it! The sign at the Dutch Harbor airport. Notice the latitude and longitude; this is the farthest north I have ever been! So far, I am adjusting to life at sea. The first day the boat was a little rough and I got a bit seasick, however after seeing the ship’s medic for some medication I am feeling much better. During our first full day at sea we had to practice safety drills, which are required within 24 hours of departing. Once they announce the drill, you have to grab your life jacket and survival suit from your stateroom and bring them to the assembly point on the deck. Then, we had to practice putting on the survival suit, which is sort of like a giant wet suit complete with a hood, lights and a manually-inflated flotation device. The plane I flew on from Anchorage to Dutch Harbor. The ship itself is like a small city; there are the residences, which are the staterooms where we sleep, the entertainment, which is the lounge where there is always a moving playing, and the restaurant, which is the mess hall where great food is served three times a day. However, this “city” runs and powers itself; all electricity and water must be made aboard the boat. The hardest adjustment so far has been a temporal one. I am responsible for the 4am – 4pm shift in the fish lab, which means I must rise by 3:30am every day! I am normally not an early riser so this has been tough, but the rocking of the ship means that when I do go to bed I normally get a great night’s sleep! Scientists collect the ear bone, called the otolith, from pollock to determine their age. This bone grows in rings for each year, just like a tree! Hello! 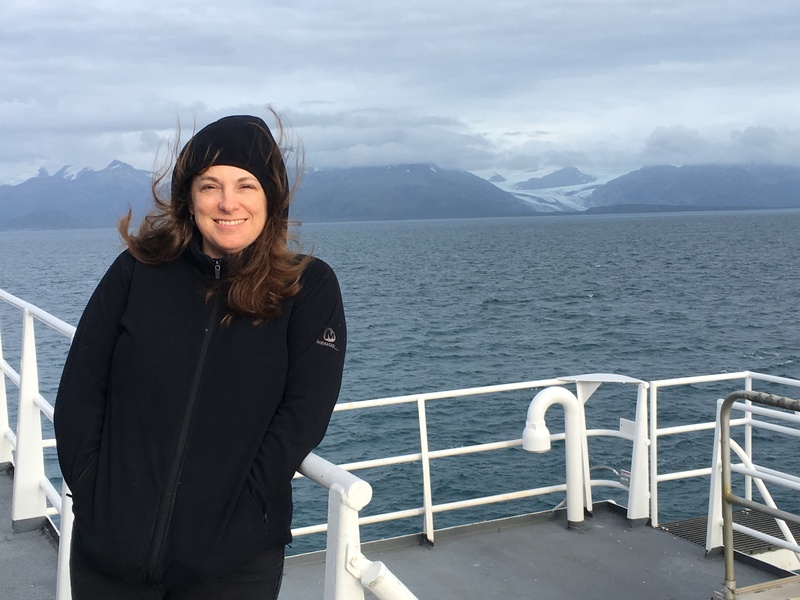 My name is Emily Cilli-Turner and I will be aboard the NOAA Ship Oscar Dyson as a participant in the 2018 NOAA Teacher at Sea program. I am Assistant Professor of Mathematics at the University of La Verne in La Verne, California where I teach the entire undergraduate curriculum in mathematics. This will be my sixth year teaching full-time. My bachelor’s degree in mathematics is from Colorado State University and I received my doctorate from University of Illinois at Chicago, where I specialized in undergraduate mathematics education. I am especially interest in the transition students make when they enter a proof-based course and how to best acclimate them to the abstract and non-formulaic nature of proving. I am passionate about math and science education and excited to use the data collected from my time on the ship to create real-world applications problems for my students. I will be teaching Calculus I and II next semester and I plan to use the data gained from my experience to teach my students about concepts such as rates of change and statistical techniques. I have a strong love for the ocean and so I am excited to be on the water for so long. I am transitioning to California after living in Washington, where I co-owned a 23-foot sailboat with some friends. We often would sail to different islands and ports on Puget Sound, which was always a blast. When I am not teaching or sailing, I enjoy walking my dog, hiking and reading! In about a week, I will fly to Dutch Harbor, Alaska to board the NOAA Ship Oscar Dyson and participate in the Alaska Pollock counting survey. Before receiving this placement, I have never really heard of Pollock, but after researching it I realized it is an amazing fish! Pollock can easily taste like other fish and is often used for imitation crab amongst other things. I am also really excited to meet the scientists and the crew. The reason I know about the Teacher at Sea program is that I have a friend that works at NOAA in Seattle. I mentioned offhandedly that I would love to go out on a NOAA cruise and she said, “Well…they do have the Teacher at Sea program.” I was immediately intrigued and I wrote my application as soon as it was available. As a person who is passionate about education and the ocean, the Teacher at Sea program is a great fit for me and I know I will learn a lot that I can take back to my students. Hopefully, I can also inspire them to seek out a career with NOAA. Pollock eat crabs, shrimp and small fish. A sign hanging in the airport when I landed in Dutch Harbor. If this is where I started and my most recent coordinates are below, which way have I been traveling? Photo of NOAA Ship Oscar Dyson at port in Dutch Harbor, AK. On this leg of the Research Cruise in the Eastern Bering Sea I will be helping a team of NOAA scientists collect data about a fish species called Pollock. The datum (plural of data) that are collected will help to set the limits for how much pollock the fishing boats are allowed to catch. The data also allow scientists to track the populations of the pollock to look for patterns. For additional information on Pollock, visit the NOAA fisheries website here. During the survey, acoustic (sound) signals will be sent into the water by transducers at different frequencies and these acoustic signals will bounce off of the objects in the ocean and bounce back to the ship where the echoes will be picked up by the transducers. The data collected from each echo is presented visually to the science team. When we reach a spot where a lot of the acoustic signals returning to the boat indicate the presence of fish, a trawl sample will be taken at that location. 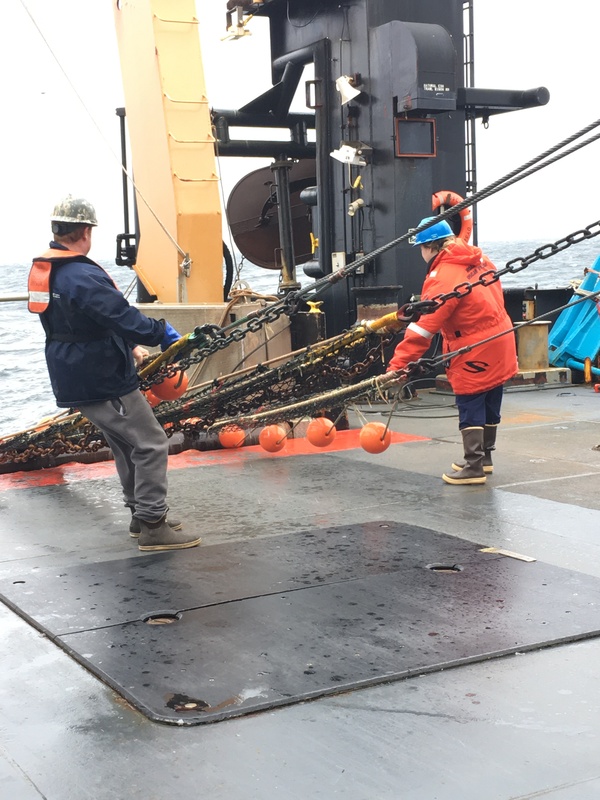 A trawl survey includes putting a large net into the water and scooping up a sample of all of the living things in that location. Once the trawl haul is brought onto the boat, it is taken to the fish lab where the fish are identified and measured. The area being surveyed is the Eastern Bering Sea and for this study is divided up into 28 different transects have been mapped out and are spread 20 nautical miles apart. We will start at northern point of the first transect and travel south until we reach the bottom of it. Once we reach the bottom of the first transect we will travel 20 nautical miles west to the southern tip of the second transect. We will then travel north along this second transect until we reach the top and then travel the 20 nautical miles west until we reach transect 3. This will continue throughout my time on the ship, and on the 2 other legs of this journey. On this first leg of the research cruise, the aim is to survey and sample from 16.3 of the transects which will total a journey of 2627 nautical miles on the transect lines. Map of transect lines for NOAA Ship Oscar Dyson over the 3 legs of the Eastern Bering Sea Pollock survey. Current location is shown by the yellow boat. Can you find it? Hint: It’s near the vertical lines on the right. First transect is the farthest on the Eastern (right in this photo) side. It was a long trip getting to Dutch Harbor, Alaska, but it has already been worth it! I am on the Island of Unalaska, which is a part of the Aleutian Islands of Alaska. The main port city is called Dutch Harbor, or commonly just “Dutch”. This is such a beautiful place that I probably never would have seen otherwise. There are mountains filled with grasses, berry bushes, and wild orchids as well as snow-topped peaks and natural waterfalls. There are bald eagles everywhere and foxes that are so fluffy they almost appear to be dogs from far away. Looking into the water you can see a few scattered otters floating on their backs and the occasional harbor seal. This photo was taken from the bow of NOAA ship Oscar Dyson at port in Dutch Harbor, AK. As soon as I landed in Dutch, I was greeted by two of the scientists that I will be working with, Matthew and Sarah. They took me to NOAA Ship Oscar Dyson to drop off my luggage before we all went out to dinner. I was pleasantly surprised to find out that I actually had my own stateroom. Due to the number of female scientists and us being on the same work shift, we were both able to have our own rooms. The rooms are so much nicer than I had anticipated them to be! The mattresses are comfortable, I have a desk space, there’s a television (that I will probably never watch) and I have my own bathroom as well. Photo of my stateroom and bathroom on NOAA Ship Oscar Dyson. After we had dinner and returned to the ship, I went on a mini hike with one of the members of the science team and we went to view this amazing natural waterfall. You wouldn’t know it was there if you weren’t looking for it. There is so much more that you can do when the sun is up for most of the day. At 11:30pm (the latest i’ve stayed up so far) it is still light outside. There are so many clouds that the sky looks pretty grey, and there are a ton of clouds, often hiding the tops of the mountain peaks. Photo of TAS Lacee Sherman in front of a waterfall in Dutch Harbor, Alaska. The next morning I woke up and went for a nice long walk along Captain’s Bay and sat and had coffee on the rocks and just admired the incredible view. It is so much more beautiful here than I had imagined. Later a few of us went for a drive around the island and a few people surfed in the ocean, but I wasn’t brave enough to get in the cold water this time. Since we will be on the ship for a while (23 days) we stopped at the grocery store to bring a few things onboard that we want to have in addition to our regular meals prepared on the ship by the stewards. I decided that I wanted to bring some fresh fruit, not realizing that I would be paying way more than I expected for them! Everything is expensive here! $26 dollars worth of fruit in Dutch Harbor, AK. Even though we think of Bears and Moose being found all over Alaska, they are not found on the Island of Unalaska at all! 6/6/18- Bald Eagles, Jellyfish (2 species), Humpback Whales!! These are crab fishing “pots” that are used by Alaskan Fisherman to catch crab. How many bald eagles do you see in this photo? We have made it to the most northern point on the survey. The main focus of this survey is to gather information about juvenile walleye pollock, Gadus chalcogrammus. Juvenile pollock less than 1 year of age are called young-of-the-year, or age-0 juveniles. Age-0 walleye pollock are ecologically important. Many species of birds, mammals and other fish rely on them as a food source. Adult pollock have a high economic value. Pollock is commercially fished and commonly used in fish sticks and fish and chips. 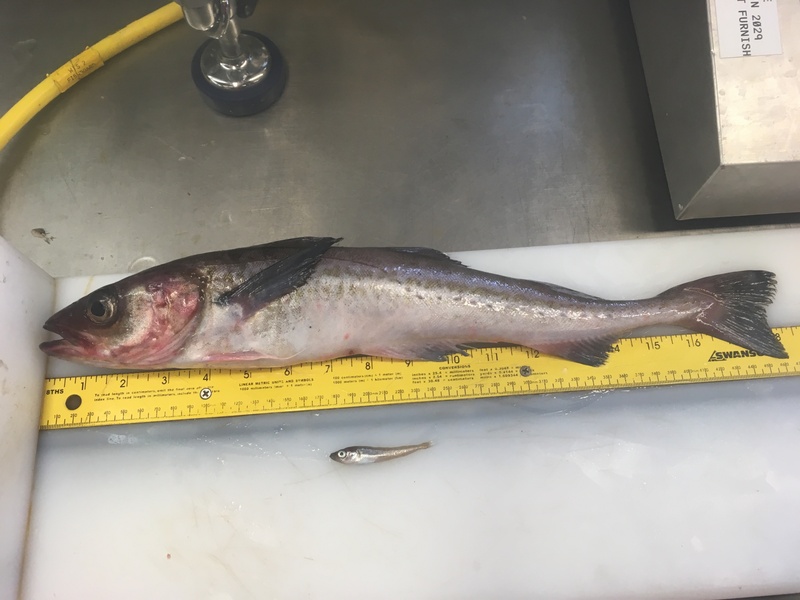 This study is interested in learning more about the size of current juvenile pollock populations, where they occur, and how healthy they are. An age 0 juvenile pollock is shown below an adult pollock. In order to collect a sample, a trawl net is lowered into the water off of the back of the ship. The deck crew and bridge crew work together to release the right amount of wire and to drive the ship at the right speed in order to lower the net to the desired depth. The net is shaped like a sock, with the opening facing into the water current. In order to keep the mouth of the net from closing as it is pulled through the water, each side is connected to a large metal panel called a “door”. As the doors move through the water, they pull on the sides of the trawl net, keeping it open. When the doors are ready to be put in the water, the fishing officer will instruct the winch operator to “shoot the doors”! The deck crew bring the trawl net back on deck. One of the metal “doors” can be seen hanging off of the back of the ship. Sensors help monitor the depth of the upper and lower sides of the net and relay a signal to computers on the bridge, where the data can be monitored. Sensors on the trawl net relay data to computers on the bridge which show the position of the net in the water. Once the net is reeled in with a large winch, the catch is placed on a sorting table, in a room just off of the back deck called the fish lab. Here, the science team works to sort the different species of fish, jellyfish, and other kinds of marine animals that were caught. Crew members stand below a winch and empty the catch from the trawl net into a large bin. The catch is then sorted on the sorting table in the fish lab. Juvenile pollock are sorted into their own bin. If it is a small catch, we weigh, count, and measure the length of each one. However, if it is a large catch, we take a smaller sample, called a subsample, from the whole catch. We use the weight, lengths, and count of animals in the subsample to provide an estimate count and average size of the rest of the fish caught at that station, which are only weighed. This information is compiled on a computer system right in the fish lab. Here I am measuring some fish. 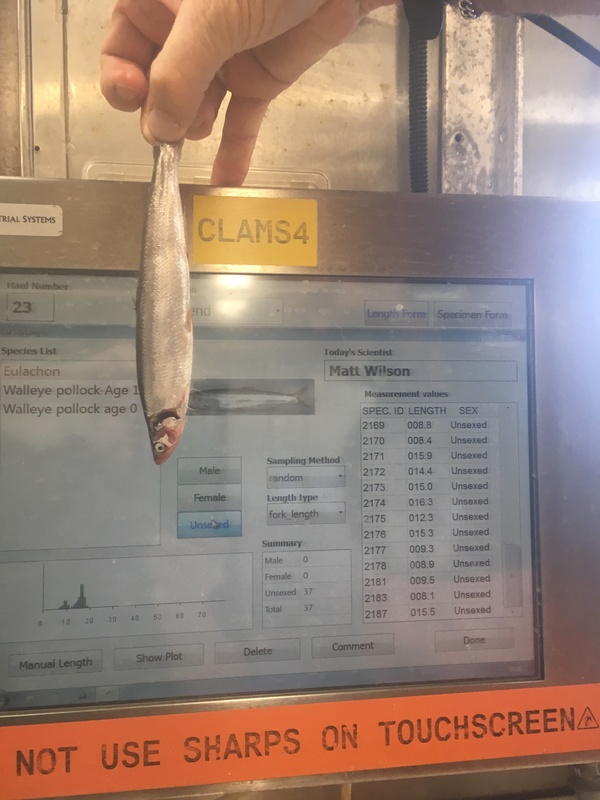 Data from the catch is collected on computers in the fish lab. The focus of this study is juvenile pollock, but we do catch several other species in the trawl net. The presence of other species can provide information about the habitats where juvenile pollock live. Therefore, data from all species collected are also recorded. A small sample of juvenile pollock are frozen and saved for further study, once back on land. These fish will be analyzed to determine their lipid, or fat, content and calorie content. This data reveals information about how healthy these fish are and if they are getting enough food to survive through the cold Alaskan winters. Other agencies within NOAA also conduct scientific surveys in this area. 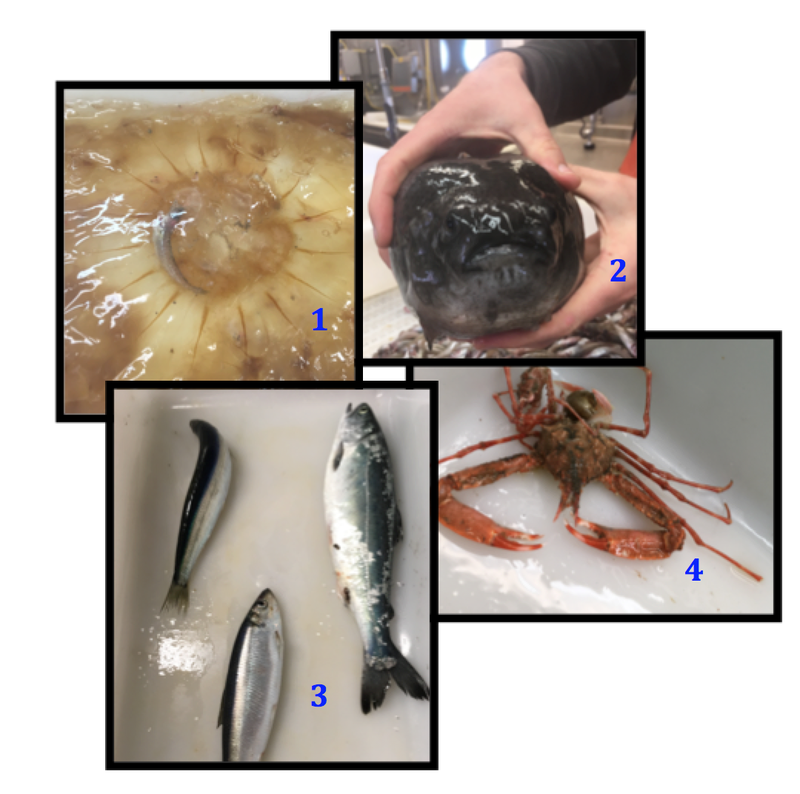 These studies might focus on different species or abiotic (non-living) properties of the Gulf of Alaska marine ecosystem. The data collected by each agency is shared across the larger NOAA organization to help scientists get a comprehensive look at how healthy marine ecosystems are in this area. As we move from one station to the next, I have been spending time up on the bridge. This gives me a chance to scan the water for sea birds and marine mammals, or to just take in the scenery. Other members of the crew also like to come up to do this same thing. I have really enjoyed having this time every day to share in this activity (one of my favorite past-times) with other people and to learn from them how to identify different species. Here I am outside of the bridge, posing with some glaciers! You can find the exact age of many fish species by looking at a bone in their ears! Fish have a special ear bone, called an otolith. Every year, a new layer will grow around the outside of this bone. 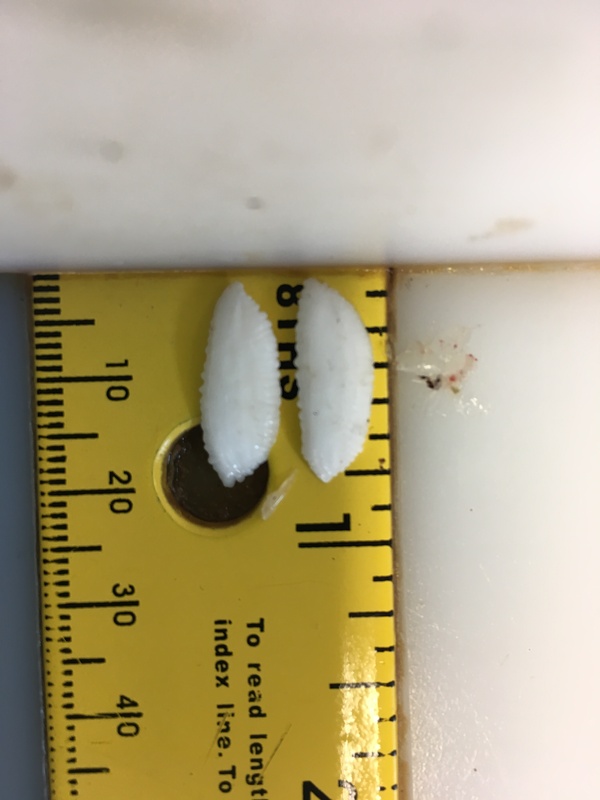 As the fish ages, the otolith gets larger and larger. Scientists can find the exact age of the fish by cutting a cross section of this bone and counting the rings made from new layers being added each year. Out on the east coast waters utilizing my favorite form of Baltimore’s transportation options – its fleet of kayaks! It is hot and sticky here in Baltimore and I am looking forward to breathing in the crisp air in Alaska. I am also looking forward to being out on the water. As a Baltimore resident, I am able to spend time in the beautiful Chesapeake Bay. It is a great place to get out on a kayak and take in nature. I can’t wait to take this experience to the next level on the waters of the Gulf of Alaska. I try to go on at least one big adventure each year, and the Teacher at Sea experience definitely will fulfill this goal for 2017! I am also excited about all of the new things I will learn on this trip and I am looking forward to sharing these with my students. I teach STEM courses to students who attend online school. I have seen how connecting scientific experiences and data with students can spark their interest in STEM fields. I am very excited to have the opportunity to use this experience to engage students in scientific activities and discussions. This mission will take place on the NOAA Ship Oscar Dyson, which has its home port in Kodiak, Alaska. From Kodiak we will move through the waters surrounding Kodiak Island and eastward into the Gulf of Alaska. The scientific team will be studying populations of walleye pollock and zooplankton in these waters. The mission will be conducted in two parts. I will be aboard for Leg 1 of the mission. Leg 2 will begin shortly after we return to port on September 2nd. The map below show all of the sampling locations that will be visited during this mission. Leg 1 sampling locations are indicated by red dots. At each location, a variety of sampling will take place. From what I have learned about the mission, it looks like we will be using several different trawls to collect samples. We will then use a variety of methods to identify species and collect data once the samples are onboard. 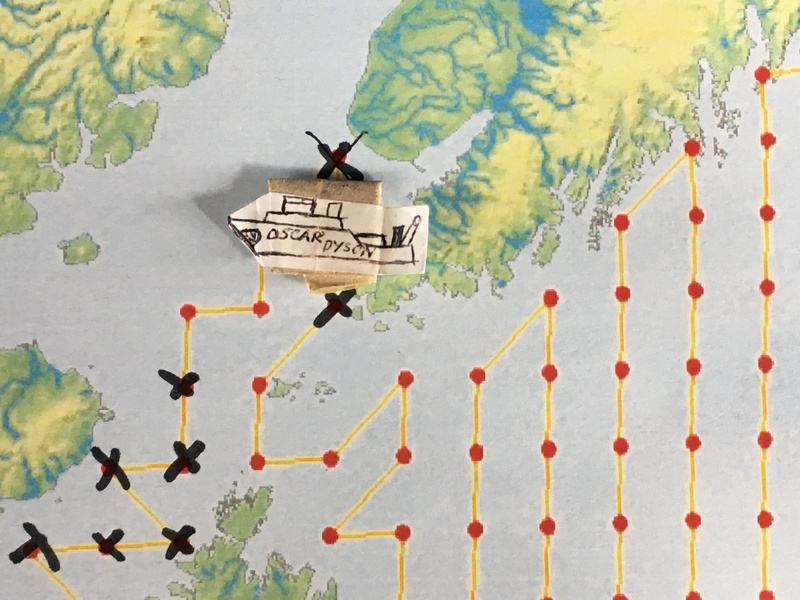 This map shows the sampling locations of Leg 1 (red) and Leg 2 (blue) for the Gulf of Alaska Juvenile Walleye Pollock Survey. Courtesy of NOAA. The Oscar Dyson is described as “one of the most technologically advanced fisheries survey vessels in the world.” From what I see on the NOAA website, it seems to have an impressive amount of scientific equipment onboard. It has a wet lab, dry lab, computer lab, biology lab and hydrology lab. It also has a wide array of data collection gear and mechanical equipment. I am looking forward to checking out all of this equipment for myself and learning more about how it will be used. NOAA Ship Oscar Dyson on the chilly waters in Alaska. Courtesy of NOAA. This study will focus on collecting data on walleye pollock populations. This fish is a member of the cod family and lives primarily in the waters of the northern Pacific Ocean. As juveniles, this species feeds on krill and zooplankton. As they mature, they eat other fish, including juvenile pollock! Many marine species rely on populations of these fish as a food source in the Gulf of Alaska. Humans also like to eat pollock. It is sold as fillets, but is also used in fish fingers and to make imitation crab meat. Pollock fillets are becoming more popular as cod and haddock populations become overfished. Pollock populations have fluctuated over the years, but are not currently overfished. The dotted line in the graph below shows population numbers in the Gulf of Alaska (GOA). The dotted line on this graph shows the population numbers of walleye pollock in the Gulf of Alaska (GOA). Courtesy of NOAA. A scientist from the U.S. Fish and Wildlife Service will also be aboard the Oscar Dyson conducting a seabird observation study. She will work mainly from the bridge, keeping track of the different seabird species she sees as we move from one sampling location to the next. I am excited about my upcoming adventure for many reasons. As an undergrad, I majored in Natural Resource Management. I went on to be a science teacher, but have always been interested in learning about findings from ecological studies. This experience will allow me to get an up close look at the technology and techniques used to conduct this kind of study. I am looking forward to being able to contribute to the team effort and learn new things to bring back to my students. I am also very excited to be aboard a ship off the coast of Alaska. A trip to Alaska has always been on my bucket list and I am looking forward to taking in the scenery and spotting marine mammals and seabirds. I am also hopeful that we will be able to see a partial solar eclipse from the water. I am bringing my sun viewers, just in case! It would take 88 hours to drive from Baltimore, MD to Kodiak, AK. Glad I am flying! Courtesy of Google Maps.